So, you've decided to give AuroraSim a try. Since I'm "remodelling" Excelsior Station with a completely fresh virgin setup, I thought this would be a good opportunity to provide some information on the process. Keep in mind that I am using my preferences as example, so much of this is completely up to you. Please note that I am using 0.4.2. At the time of this writing, 0.4.0 is the latest stable release. Most of the .ini files are set as .ini.example, so I will be editing each in turn. If you're used to using OpenSim, there are some differences in setting up AuroraSim, but nothing too difficult, since you already know that it is the .ini files that contain the configuration information. But, bear with me anyway as AuroraSim has changed what the .ini files are and where they are. If you aren't used to OpenSim, well, that is what I will be detailing here. What AuroraSim has done is break down the various configurations into separate .ini files making it easier to change only those things that you want to change. These files are found in /bin/Configuration. Two .ini files that are not there is RegionConfig.ini, which is still in /bin/Regions, and Aurora.ini, which is in /bin. Aurora.ini is AuroraSim's version of the OpenSim.ini file. The first thing to know is that there is no need to edit the Aurora.ini file, but feel free to check it out. As I've already said, the relevant .ini files are found in /bin/Configuration. From the screen shot, you can see how everything has been organized. You can see the Main.in and the folders containing all the others. This is the file that you edit to set up as StandAlone, AuroraGrid or RobustGrid. I am detailing the StandAlone setup here. If anyone will do a write up for the other two, I will post them. So, the Main.ini file is already configured for StandAlone, so there is no need to change anything here. The rest of this piece will look at each folder in turn. You will see 5 files in this folder, all ending with .example. These files determine which database you use. I use MySQL. 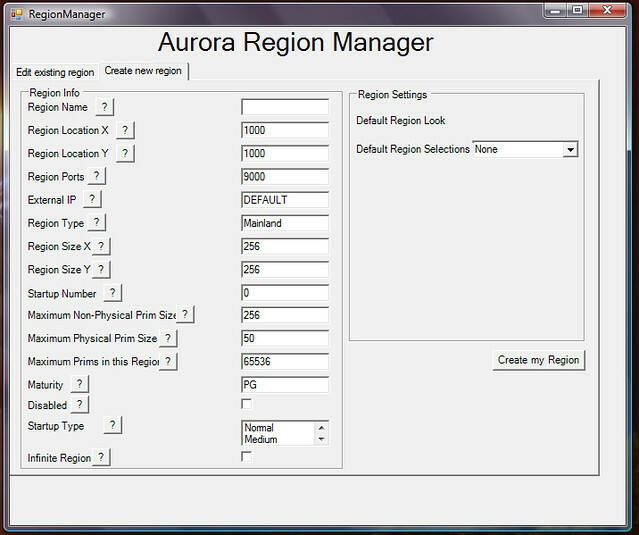 AuroraSim has added a FileBased database as well, which is a region information database. Its a great help in loading your region(s) quickly. It also runs backups at a frequency that you can determine. The first file to edit is Data.ini.example as this determines the other ones you will need. This file has SQLite and FileBased enabled. I don't use SQLite, I use both MySQL and FileBased, so I comment out the line enabling the use of SQLite and uncomment the MySQL line, enabling the use of MySQL If you've never edited an .ini file, that means removing the semi-colons at the start of the line to enable and adding a semicolon to comment that line out, disabling its information. Once you have edited this file as you like, save it as Data.ini, dropping the .example from the end. Next, I open MySql.ini.example to ensure that it will work with the MySQL database. Since I am using the setup provided with SoaS, I simply change the *** to 123. If you are familiar with MySQL, then you will know what information to put where. For those of us who are not familiar with MySQL, the SoaS setup is an excellent one to use. I then save the file as MySql.ini, again, dropping the .example. I will be doing this all through, so I will not bore you by stating it every time. Next is the FileBased.ini.example file. Even if you don't change anything, it is best to give it a look over and then save it as an .ini file. The FileBased system does regular saves of your region information on a timer. The default is every 5 minutes. It runs in the background and you don't notice it, so it is up to you. You can also detail where the saves are kept. it also does a full backup once a day. It also runs a backup whenever you shutdown your sim. Frankly, I just leave things as they are on the general principle of "If it ain't broke, don't fix it". Since I am running as a StandAlone, and will be keeping it that way when Excelsior Station goes public, I have no need to change these. 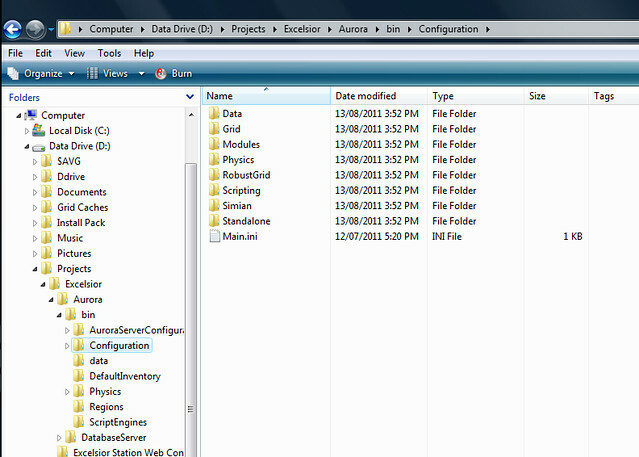 In this folder you will see 13 .example files and an AssetCache folder. The AssetCache folder contains the CenomeCache.ini and the FlotsamCache.ini files. There is no need to edit these. As you can see from the file names, the 13 module .ini files allow you to configure a variety of things. Economy, Groups, Voice and so on. There are other modules that can be added, but that is done when you get the source code and compile yourself. A subject for another time. I don't use all 13 of the modules, so I will leave those files as .examples. So, if I skip one, don't worry. Open it up, look it over, configure it as you like and save it as an .ini. I do use some of the Advanced features, such as Media-on-a-Prim, so I do create Advanced.ini, though I don't change any settings. One setting you should change is towards the end of the file and that is the bit about MultipleThreads. Change the number to the one that suits you processor. Since I am running a single core, I leave this at 15. Next is AssetCache. This is already configured to use Flotsam, so simply save it as .ini. AuroraModules have a number of things you can change, like chat distance. In the MapModule section I set DrawPrimOnMapTile to false. This loads the world map much faster and lets people to see the underlying terrain, rather than big blocks of grey or black. In the CombatModule section I change ShouldRespawn to true and set the respawn position to 50, 50, 4001. I place a 100m x 100m platform at 50,50,4000. This means that anyone killed in combat will removed from the field to that platform They can recover and prepare to enter battle again, so this provides a bit of a respite. I also enable weather, just for variety. I'm not using Economy at this point, though I will in the future, so I simply save it as an .ini file. The same with Groups, I'm not using it now, but will in the future. Its in this file that you set things like linking limits, prim size and so on. I keep my prim size to 256 and change physical prim size to 100. I set minimum prim size to .001, great for jewellers. I change MaxHollowSize to 99.9. Leaving it at 100 simple doesn't make sense to me. Does a 100% hollow make a prim vanish? Frankly, I'm a bit scared to try. I set max link limit to 256, since the viewers I have used all have that as a limit when importing objects. I set the MaxLinkLimitPhys to 100. That should make for some nice vehicles. I leave all the rest as they are. Day length, wind, trees are in this file. I like to set the wind to use the ConfigurableWind plugin. Now that we can use Infinite regions to travel around, this will be good for those sailors among us. I use the settings provided, but that is because I am unsure of exactly what they do. What is the maximum strength? Direction is likely in degrees, but is 0 degrees North? If someone would post the details about these, I would appreciate it and will add the information. Cloud is that layer of cloud that exists in Second Life at about 150m. I've always found it annoying as they move through walls, making builds at that height look like saunas, so I disable this. Trees. You can set your sim so that trees grow and die. You plant them using your viewer's build tool. I set this to active as I plan on planting some and texturing them to look alien. This is an important module. It determines who can run scripts, have god abilities and more. I generally leave this alone, but it is here that you would set things up to give partners the same abilities as you. I keep this one as is, too, simply saving it as a .ini file. But look through it. You can set your sim's FPS, Estate settings, which viewers to allow or ban and more. Since I have no need of RemoteAdmin at this time, I simply save it to .ini. Again, I leave the defaults and save it. There's a few things here that I do configure. I make the default name of primitives "Prim". I set the maximum number of prims to 100000. And I set the maximum number of attachments to 50. I don't use Voice, so I simply save to .ini. Okay, so that's the Modules. Next is Physics. In this folder you will find 4 .example files. The first to open is Physics.ini.example. This is the file that determines which physics engine you want to use. I go with the AuroraOpenDynamicsEngine. It simply works better. 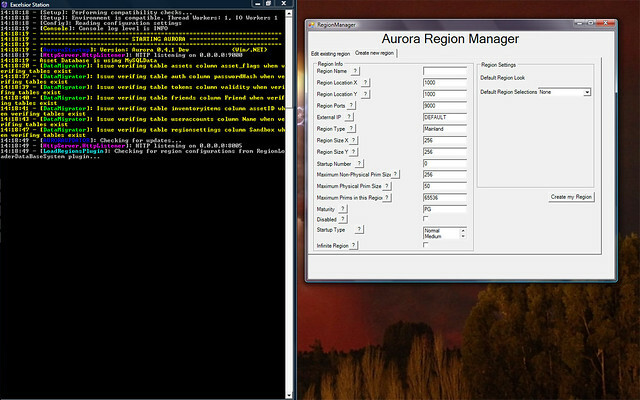 The AuroraOpenDynamicsEngine has a few settings to look at. The very first is your sim's BasePhysicsFPS. Its defaulted to 22.5, though i do not know why. I set this to 45. Its also in this file that you can change the point of gravity. That is, the ground does not have to be the ground. I haven’t tested this since version 0.3.*. At that time, the problem was that your avatar stayed oriented with feet to the default ground, no matter what the gravity point was. I keep the rest of the settings as is since I have not yet played around with them. I also save the Meshing example file to .ini. Since we're using StandAlone, I don't do anything with the example files in the RobustGrid folder. Simian I do nothing with. Standalone. The first thing to do is to save the StandAlone.ini.example file to .ini. This has all the LocalConnector information that is needed. Its in StandaloneCommon.ini.example that are all your optional settings. It is here that you can set your sim to use IWC. Since Excelsior Station is not yet public, I leave this disabled. Farther down you will find the GridInfoService section. here is where you set your Grid Name, nickname, IP address etc. Below that you will find LoginService. Here you can set a welcome message. If you continue down to the bottom, you will find the section that allows you to change the sun, moon and cloud textures. Unfortunately, I have no idea of how to generate UUIDs for new textures. Another future article on that. Regions. Don't do anything here. 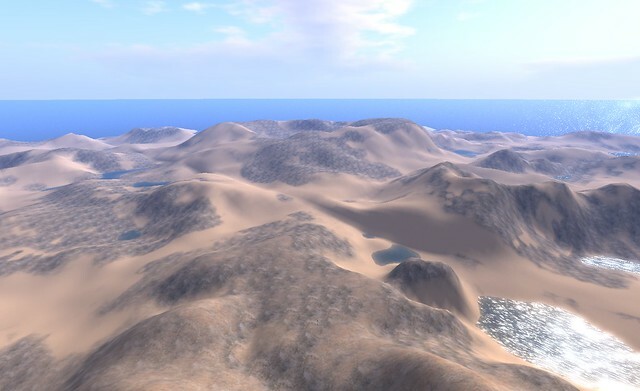 Like OpenSim, the region files will be created when you start AuroraSim the first time. If you save the regionConfig.ini.example file to .ini, then you will get errors related to the UUID that is currently there. Once you have created your first region, you can either copy and paste the information form the new region file, or simply rename the region file to .ini. However, it is a good idea to look through the current RegionConfig.ini.example file to see all the things you can configure. And now you're almost home free. Everything should be configured and you're almost ready for that first startup. But before that, copy the Configuration folder! You don't want to have to go through all that work again, do you? Okay, now its time for that first run. Don't forget to start your MySQL if you're set up that way. You might see some yellow text showing up with database verification issues from the DataMigrator. I'm not sure, I just assume its not finding any data to migrate. Soon enough, the Region Manager will pop open. 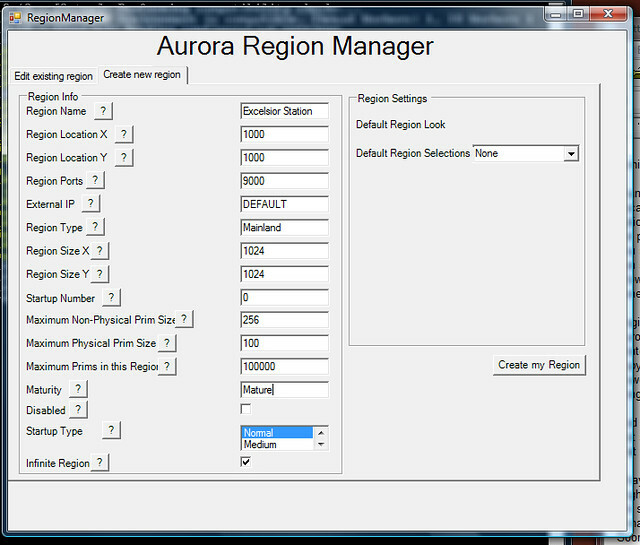 The Region Manager is a feature of AuroraSim that makes it easy to create and modify your regions. At the top you will see two tabs, Edit existing region and Create new region. Be sure you double check and click the Create new region tab. There's some things worth mentioning about the Region Manager and setting things up. When defining the size of your region, the dimensions must be in multiples of 32. 1024 works, but 1000 does not. Below those is an entry for Startup Number. I'm not sure, but I think this allows you to determine in what order your regions will load. You will see settings for prim sizes. My understanding is that these will override the settings in the .ini files you configured. I set mine to the same values, though, just in case. For Maturity you can set to PG, Mature or Adult. Since Excelsior Station allows combat, Mature is fine. I can do PG while its a private setup, but I want to get in the habit of always setting this. At the bottom you will see Startup Type. I choose Normal, but, to be honest, I don't know what this does. Also, just below that, you will see the Infinite Regions checkbox. Infinite Regions is a feature that allows you to travel across that no-man's land between unconnected regions. That is, I can create a new region anywhere else on the map and travel to it without TPing. One thing, though, if that other region does not have this enabled, you cannot travel back. So, once you have everything entered, give it a look and make any changes and then click on Create my Region. The region Manger closes, the console runs and then the console will tell you that your region is not part of an estate. It will then ask for the ask for the Estate owner name and will provide Test User as the default. This is where you create your account. In my case, I enter Sarge Misfit, it states that it could not find user Sarge Misfit and asks if I want to create this user. Yes,of course, and then it asks for a new password and email address. Be very careful of the typing of your password! AuroraSim does not display the characters! Next it will state that you have no estates and will prompt you to give a new estate name, with My Estate being the default. Enter what you like (Excelsior Station in my case) and then it asks for a password. I enter one out of good habit, but you don't need to do so. And that's it. The final prompt will come up, Region <region name> # with the flashing cursor. Start up your viewer, load your terrain .oar file and start building. Obviously, I like AuroraSim, but the one thing that is difficult is applying terrain maps to it. That is, until I came across Matto's World. Matto is one of the developers of AuroraSim and he's got some good info on his site. Unfortunately, he shuts it down when he's offline. So, i thought I would post instructions here. The first thing to keep in mind is that terrain maps, whether in .raw or .r32 format, are made to fit a region that is 256m x 256m. Obvious, yes, until you try dealing with AuroraSim's variable region. Excelsior Station is a single region that is 1024m x 1024m. That is the equivalent of 16 standard sized regions. A standard terrain map does not stretch. I know, I tried. When I first started building Excelsior Station, I was using Sim-on-a-Stick which comes with a 4 region mega region already setup. I experimented and learned about how to make regions contiguous and loading terrain maps and so on. I ended up with a 16 region mega and it was a pretty nice looking bit of land at the end. Then I got to using AuroraSim and liked its performance much better. And I really wanted to have that land from SoaS in AuroraSim. So, from scratch, here's how you develop a terrain for a region bigger than 256m x 256m. First, you need to organize your terrain maps. Start with SoaS and add the proper number of regions at the proper locations. It will be easier if you number them. Using Excelsior Station as our working example here, I numbered mine 1 through 16, laid out in a square grid of four regions by four regions. I'm not going to assume that you now how to do that, so, what you do is you use the console (that command prompt window) and the command create region <region name> <file-name>.ini. The OpenSim wiki has all the console commands listed at [http://opensimulator.org/wiki/Console_Commands]. I recommend saving the page to your harddrive for easy access. Yes, its a bit of work. In my case, It was create region 1 1.ini, go through all the configuration like location, port, estate etc, then on to the next one create region 2 2.ini, repeat until you have things as you like. Note: Be sure you do not use the same 9000 port! Each region has to have a different one. Using numbers to name the region makes that easier as the port would be 900<region name - 1> so, region 2 used port 9001. Region 16 used port 9015. Once you have your regions created, shutdown and go to the Regions Folder, /bin/Regions. In there you will see all 16 .ini files as well as the RegionConfig.ini file. Make a copy of that file and rename it so you have a backup of it. I tend to rename it RegionConfig.ini.original. Now, open the RegionConfig.ini file and delete everything. Next, open, copy and paste the information form each of the .ini files that you created. These hold the info about each of your regions. The Diva Distro that comes with SoaS is set for Contiguous Regions, that is, all the regions listed in the RegionConfig.ini will be treated as one big region. So, make sure that you have the location coordinates of each region set right. Yes, you can change them. When listing the regions in the RegionConfig.ini file, they must be in order from South to North, West to East. Note the progression of the location coordinates. South to North is the second number and it increases. West to east is the first number and it increases. And note the internal port numbers are all different. Now, fire it up and then login. This is simply to make sure that they are all in their proper positions. Remember, you can change the location coordinates. Now, once things are where you want them, its time to load the terrain maps. Stay logged in, but fly up a little so you can see how things look. I recommend flying to the center coordinates changing your draw distance to to extend to just beyond the corners of your minimap, too. This will let you see all of your land at once, allowing you to verify if you want that terrain on that spot. So, now you make sure you know where your terrain maps are. I copied mine to my root directory, which is C:\ for most, but I have a 2nd harddrive, so its D:\ for me. This is simply to save you from having to type in the whole directory path. In my case, it would have been D:\Projects\Excelsior\Terrains\<terrainmap>.raw. 16 times over. The first thing you have to do is change the region your are accessing through the console. Very easy, its change region <region name>. So, my first one would be change region 1 The console will now say region <region name> and the flashing cursor Next you type in the command terrain load <path>\<terrain file-name>.raw or .r32 if that is the file format. Switch back to your viewer and take a look at the result. You can load a different terrain map if you don't like the result, it replaces whatever is there. Repeat the two commands until your world is loaded. Now you need to logout and shut it all down. Take a break, there's more to be done. Now that you are back form your break, let's continue. One of the problems with the OpenSim megaregion setup is that you cannot apply ground textures to all of the regions at once. This means that you will have to do them one at a time. Change it to false and save. Once saved, fire everything up and login. Once logged in, go from region to region and apply the ground textures you want. Go ahead and do a bit of terraforming, but realize there's nothing you can do about those sudden cliffs at the region boundaries. Yet. Once you have done that, it is time to export those terrain maps. Matto's instructions include using terrainmaps as well as .oar files. I had best results using .oars, so that is the one I will describe here. This is done in a similar fashion as when you originally loaded the terrain maps, but its quicker. You change region, each in turn and use the save oar command. Once you are done, logout and shut down. You won't be needing SoaS to complete things. Install and start AuroraSim. Don't worry about setting it up with MySql at this point. Don't worry about what to call the region or any of the other configurations. The priority here is to deal with the terrain. Version 0.4.2 has a Region Manager, which is pretty straight forward to use. You'll also be prompted to create your username and password and all that other good stuff, but you only need basic things for now. Once you are all setup, its time to load those .oar files. This is done for each in turn and using an offset for their x and y. Again, its best to load them as you did with OpenSim's megaregion. That is South to North, West to East. This is done using the load oar command. And you use the x and y offsets. And you do not have to change region, either. Once that is done, login. Now you can terraform the terrain. And get rid of those region boundary cliffs. This step will take as long as it takes, but now you can get the whole thing looking the way you want, without having to go region by region. Once you have the land looking right, simply save the whole thing as an .oar file. Once. Your terrain has now been "stitched" together. That's it. Its actually fairly simple and easy, but it is a bit of work. Download SoaS and AuroraSim. If you prefer to compile AuroraSim yourself, you can get the files from their github repository here. You do not have to run SoaS from a USB stick. I run mine from my 2nd harddrive, but it is up to you where you set it up. However you decide to set things up, extract the files from both SoaS and AuroraSim and compile AuroraSim if you've chosen that method. Do not run AurorSim yet. Follow the instructions that are included with SoaS to run the Diva Distro of OpenSim. This is necessary to clear the data that is already included in the database. There is no need to go inworld, you only need to get the console up and running. Once the regions are deleted, shut down OpenSim. Next, go to your AuroraSim folder to configure it's files for use with SoaS. Next, open MySQL.ini and you will see that the passwords are set to ***. Change those to 123. After -> ConnectionString = "Data Source=localhost;Port=3306;Database=opensim;User ID=opensim;Password=123;"
And that's about it. Its really very simple. Now you can fire up the MySQL database and AuroraSim and finish setting things up. Please note, this does not set up the WebUI that comes with the Diva Distro on SoaS. That info will be added once I find it.